Follow these guidelines when shooting a space to create the best tours on Transported. All camera locations should have a direct line-of-sight connection to any other camera location which will be linked to in the actual tour. Please see the diagram below for a visual representation of this rule. 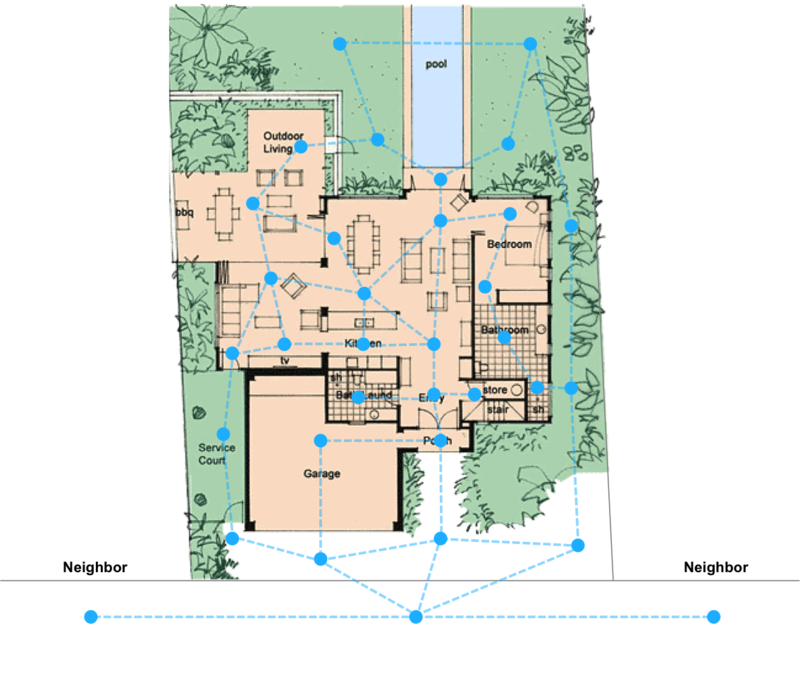 The reason this is important is because the software creates a map of the property based on the interconnections of the scenes. With this data, the software is then able to correctly orientate the viewer as they move from scene-to-scene throughout the property. A viewer who experiences consistently correct orientation will be able to develop a clear understanding of every property's floor plan. Open any doors which a viewer will be immediately passing through to move to a new scene. For example, an image taken on a front porch should have the front door left open because in the actual VR tour the viewer will be passing from the porch, through the front door, and into the foyer. This compares to an image taken from a front yard which also has the front door in view. In this case the door should remain closed because the viewer in the VR tour will not have the option to bypass the porch and move straight from the front yard and into the foyer. Try making connections in VR which you cannot make in real life. For example, allow viewers to link down to a backyard patio from an upper balcony. Or try allowing viewers to connect to another scene through a glass window. Keep the tripod/monopod footprint as small as is possible. Please note though that the footprint does not need to be "photoshopped" out. The software automatically applies a small cover to the nadir of each photo which hides the tripod/monopod. Adjust your tripod/monopod so that the center of the camera is approximately 64 inches (~162cm) off of the ground. Prep the home before beginning the shoot by turning on all lights, opening all blinds, and lowering all toilet seats. Avoid as best as is possible being reflected in mirrors. Try to not place your camera within 3 feet (~1m) of ledges. Some people who have a fear of heights can feel discomfort if they find themselves too close to a balcony's edge or the top of a stairway. ...and that's it! For more information on image format, preferred dimensions, accepted file types, and other fun stuff, please see the Knowledge Base article on image specs.